No matter what Kenworth vehicles for sale you’re looking for, we probably have it at Coopersburg & Liberty Kenworth. 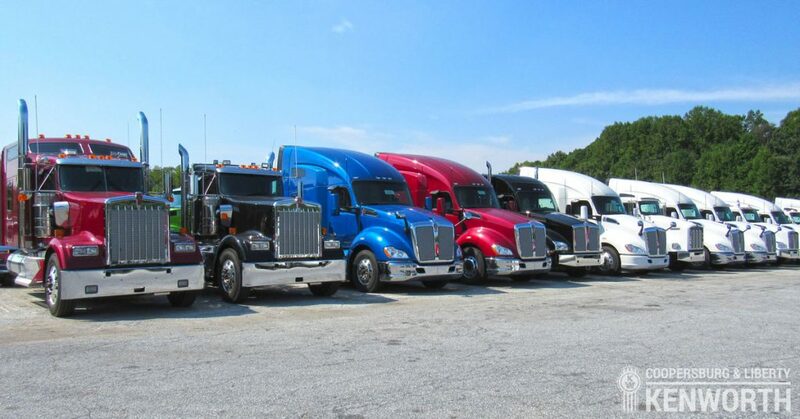 Our two extensive lots – in New Jersey and Pennsylvania – feature more than forty acres of Kenworth vehicles, both new and used! Few dealerships anywhere can boast the same selection as Coopersburg & Liberty Kenworth, and we offer great deals as well. Kenworth W900: Is there any truck more iconic than the W900? Since its introduction over fifty years ago, this “King of The Road” has been one of the most-desired trucks to own and operate. For many, having a W900 is their ultimate career goal, and we have both new and used W900s available today. Kenworth T680: From a classic, to the latest and greatest. The T680 is one of Kenworth’s newest models, a truly revolutionary truck both inside and out which is designed to increase driver comfort and lower on-the-road costs in every way possible. A T680 is possibly the smartest buy you could make in Class 8 trucks. Kenworth T880: Jack of all trades, and master of all? The argument could be made for the T880. This all-around excellent vehicle can serve in nearly any on-road role imaginable, and always perform with aplomb. It has power to spare, plus all the in-cab innovations that make Kenworth’s such a pleasure to drive. Kenworth C500: Designed specifically for highly-demanding and off-road applications, the C500 is an absolute monster which can go anywhere it’s physically possible for a truck to fit. The C500 is a must-have for pickups and deliveries far off the beaten path, while always remaining safe. Class 6 & 7 Trucks: Looking for something smaller, more fuel-efficient, or designed for in-state runs? We carry models such as the T270, the K370, and the T440. These medium-to-heavy models are cost-effective and still made with all the care Kenworth puts into their Class 8’s. Specialty Vehicles: From dump trucks to snow plows to tankers, and more, our selection of specialty vehicles can fill in gaps in your fleet – particularly our used options. Whether you’re looking for something new or used, we truly carry The World’s Best here at Coopersburg & Liberty Kenworth. Our used stock changes often, so feel free to contact us to ask about specific models or reservations!